â€œAny place where one is working for the Lord, one will face challenges and joys,â€ states Pastor Hien Truong of Vietnamese Gospel Mennonite Church, Allentown, PA. Hien would know. Since his commitment to Christ as a law student in Vietnam, his journey has been marked by the struggle of persecution and the joy of following Godâ€™s call. Hien was born into a struggling Buddhist family who hoped that one day he would become a Buddhist monk and bring success to the family. When he returned home to share the Good News with his family he was asked to choose between them or his newfound faith in Christ. Hien could not deny the call of Christ in his life. However, a year later he came home to take care of his mother who was ill and through the devotion he displayed to his mother, his family relationships were restored. After graduation from law school, Hien began to reach out to the poor in his community. He offered legal assistance, taught the Bible to illiterate children, and began to work with the Vietnamese Mennonite Church. 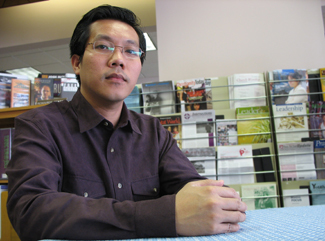 In 2004 the pastor, Nguyen Hong Quang, Hien was working with was arrested and Hien fled to Cambodia in the face of his own arrest. From Cambodia he continued his ministries with the Vietnamese church until coming to the United States in 2005. These experiences of faith and persecution shape Pastor Hienâ€™s ministry at Vietnamese Gospel. He continues to be concerned with and provide support for the Vietnamese Christians in Cambodia. â€œThe Vietnamese and other Christians in Cambodia are disadvantaged economically, ethnically, educationally, and are persecuted and harassed by authorities.â€ Hien is disturbed that human rights organizations give more to these brothers and sisters in Christ than do churches from the United States. He hopes that he can help motivate others in Franconia Conference to expand their ministry not only to the Vietnamese community in Allentown but also to those in Cambodia and Vietnam. He notes that the Mennonite church he recently visited to help plant in Phnom Penh, the capital of Cambodia, is young and needs not only financial support but also prayer, training, and guidance. Some of the members of Vietnamese Gospel are concerned that Hienâ€™s heart is still in Vietnam. However, Hien reassures them that while the support he provides to the under-privileged Vietnamese in Cambodia is a significant part of his calling he also is called to pastoral ministry in Allentown. He is deeply committed to Vietnamese Gospel and is thankful for their support, respect, and patience as he learns English and ministry in a new context. He hopes that Vietnamese Gospel can grow and reach out to their surrounding community. He works to challenge them while also seeking to meet their needs where they are.